There was a typographic omission regarding the counting of timed runs in the regs. Motorsport UK were informed immediately and the new regs are provided and will apply to the championship. Any queries, please contact Ian Thompson. To confirm, as per other championships , all timed runs will now count. So get those entries in, first, have you booked your Award Dinner tickets yet ? Final arrangements and booking codes now available for the 2018 Awards Dinner at the Stirling Court Hotel on the 16th March 2019. We look forward to you hopefully joining us for another great evening celebrating success of the drivers and the championships. Click on image to download and view full details and menu. Contact the hotel on the number provided and use the booking code for our reserved rooms and special rate. If you could please make menu choices as quickly as possible and let Iain know. As usual, a “David Baker” raffle will be run and both championships would be very grateful for any items donated and to let Iain know. Thank you. Would all major award holders from 2017 please return them for engraving for this year as soon as possible. Lowland cups and shields to Iain Scoular and Highland cups and shields to Ian Thompson. Any difficulties contact the respective coordinator. 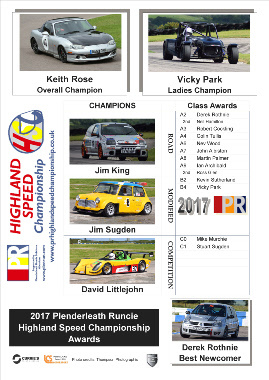 Thanks to the continued sponsorship from Plenderleath Runcie we are pleased to make available the regulations and entry form for the 2019 PR Highland Speed Championship. As in past, these are shared regulations with the MAXSport Competition Tyres (Scotland) Lowland Speed Championship and entrants who wish can enter the Highland and the Lowland Championships by ticking the appropriate boxes. Entries are now open and will be accepted until 15th April 2019. Entries should be sent to the address in the regulations along with the accompanying fee. We hope to see you at the awards dinner on the 16th March in Stirling - full details will follow soon - and in the 2019 season. the PR Highland Speed Championship results and awards have now been finalised and available to view and download here. 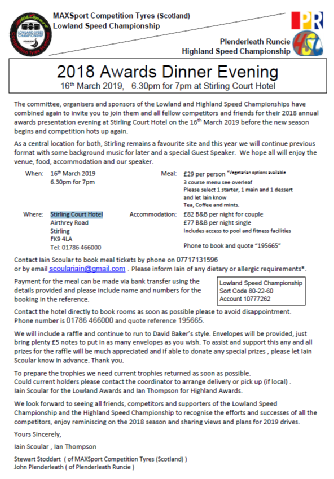 Reminder to keep free the 16th* March for the combined awards dinner in Stirling and hope to see many of you join us and the MAXSport Tyres (Scotland) Lowland Speed Championship competitors in acknowledging the success and most of all the enjoyment and friendship of the 2018 season and to share tales of what is planned for 2019. Details and regulations on the 2019 season have now been agreed with Motorsport UK and will be available shortly. Two issues were raised and updated available here. Two drivers were missing Fintray results in the file published and now corrected. This affected the awards positions for A2 and minor positions elsewhere. A reminder to everyone to check your own results and scores and contact Ian Thompson as coordinator with any any questions or issues. The results will be declared FINAL at midnight on the 23rd Dec 2018, in time for Christmas. For those new to the championship the scoring is fairly simple with each event score calculated against the class record on the day as score = 100 * best timed run / class record and only your top 11 scores count. The new layout of the table carries over from our automated tool and now has each of the positions in class, division, overall, ladies and newcomers and the provisional awards highlighted. In addition, to make it easier for drivers to check results and scores there are two additional tables showing the database entries for the times at each event and the record for each event used to calculate the scores. We hope these continued improvements of the online scoring system prove helpful. Standings after Alford now on Results page and click here. All ready for an exciting final weekend sprint at Boyndie. Any questions regarding points and positions to the co-ordinator Ian Thompson. Close competition continues and now prepared for Round 11 at Alford. This marks the watershed in the scoring as after Round 11, scores will start to be dropped and the positions will become much more fluid. We are all looking forward to another successful evening and celebrating our award winners, friendships and sharing experiences. So SAVE THE DATE for now and full details will follow. Another close battle in a number of classes with excellent weather and track conditions led to a few new class records and a number of Personal Bests at Golspie. Well done all and looking forward to return to Fintray in July after the sad news of the loss of the Boyndie June event. An excellent evening at the Stirling Court Hotel and an excellent after dinner presentation via video from John Munro on his race season in the MX5 , finished off by his arrival in time for the Q&A. Thanks again John, everyone really enjoyed the insight and the clips. We are planning to make the video available for all to view at a later date. MAXSport Competition Tyres (Scotland) Lowland Speed Championship. Finally a large thank you to our sponsors Plenderleath Runcie and their continued support. Corrected regs are now available for download and entries are being accepted for another exciting season of competition. Click here for the Regulations and Entry Form Please ensure you send in Version 1.1 of the regs. Note that Boyndie is one week later than it’s normal weekend in September. Look forward to seeing regulars, old and new competitors alike for another successful season in 2018.